There are many reasons one can be thankful. A kind word. Good advice. A hand of support during difficult times. And there can be many ways to say thank you to those who supported you. A great way to say thank you is to send them A Million Thanks. 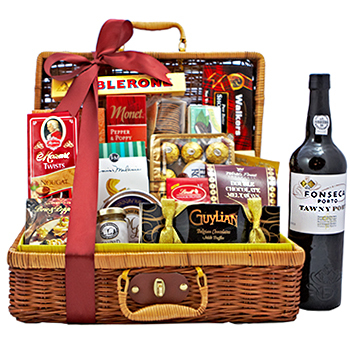 Your well-wishers will enjoy these delicious treats including a Bottle of Port Wine, a delicious Chocolate Bar, mouthwatering Cookies, Dark Chocolate Covered Mints, Ferrero Rocher bonbons, Gourmet Mustard, Swiss Chocolates, and other sweet and savory snacks. Send it as a surprise, and it will mean a lot! Attention: the packaging varies by country of delivery. Gift may be delivered in a chest, gift basket or a gift box.